Since the Rana Plaza disaster in 2013 – when a poorly built garment factory collapsed, killing 1200 and maiming 2,700 (see earlier articles ) – there have been changes in the Bangladeshi garment industry. Amid the embarrassment of global public exposure of murderous working conditions, and under pressure from leading clothing brands, Western governments, unions and NGOs, some reforms were introduced. This all occurred within a wider climate of increasing political repression by the Bangladeshi government against opposition parties and Islamic militants – with these oppositions being used as a convenient excuse for a more general authoritarianism and militarised policing of the wider society. The reforms made within the garment industry and the stricter policing have probably both served to dampen struggles in the garment industry in recent years. The state’s harsher attitude towards media reporting of unrest also seems significant, as we will comment on later in this article. 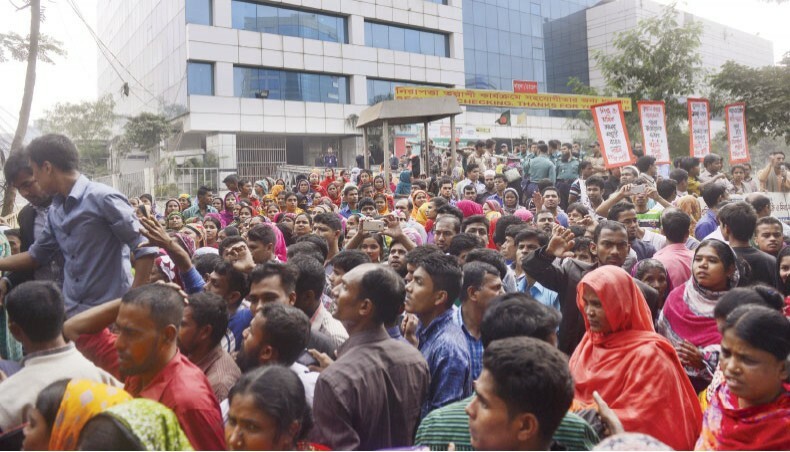 Ashulia industrial zone, Dhaka - December 12th; hundreds of garment workers from several factories walk out on strike. They demand an immediate raise in the minimum wage from Taka 5,300(£54/€63/$67) to Taka 15,000(£154/€180/$190), complaining that rampant inflation in food prices and house rents make it nearly impossible to survive on the present wage. They also protest dangerous working conditions and problems with getting paid. As workers begin to demonstrate, the movement spreads throughout the garment zone. 1) That the union wants to claim more influence than it really has. It may be that the leaflet was a catalyst to spark expression of building resentments without being evidence of a union directing events. 2) That the state and bosses want to claim the union has more influence than it really has and to account for the unrest as being stirred up by ‘outside agitators’ and so claim there are no genuine workers’ grievances. Despite repeated claims for years of outside agitators there has never been any hard evidence or prosecutions of these mysterious agents. 3) That the demand for a raise to Tk15,000 was already being discussed among workers and the unions picked up on it and incorporated it in their leaflet. The leaflet was distributed but it was not till two and a half weeks later that strikes broke out. The unions did not send demands for a wage rise to the employers federation BGMEA till Dec 22nd, ten days after strikes began. If they were the initiators it might have been expected that the union would have already officially presented that pay demand to management. Some workers said they initially didn’t know the demands of the strike but either gladly joined in anyway or were compelled to by other workers. Dec 21st; employers respond within a few days by closing the whole garment zone of 85 factories and locking out 200,000 workers. All workers’ demonstrations are banned and a paramilitary occupation of the area begins; a thousand industrial police, 900 regular cops and 15 platoons of the paramilitary Border Guard Bangladesh and Rapid Action Battalion have been deployed to crush the unrest. Bosses and police have laid charges against 1500 workers and 1500 have been sacked. As raids and arrests have been made on union offices and workers’ homes, many have stayed away from work and some union activists and militant workers have gone into hiding. Dec 27th; the bosses reopen the factories and work resumes. 15,000 workers have not returned to work; fearing retaliation and possible prosecution, many have returned to their native villages. Most of these will lose any wages due to them. Some of the workers who carried out protests across Ashulia on Tuesday told the Dhaka Tribune their factories had been depriving them of various allowances and benefits for a long time. If we break down the component parts of the wage rise we see that the 76% figure is not quite what it might appear. We’ll also see why many thousands of workers have continued to strike and violently protest all through the negotiations and continue to do so against the deal. For them it is no desired “victory”. So the present settlement could be seen as an attempt to lock workers into an annual capped below-inflation rise – meaning a long-term decline in real income. The garment industry is the country’s largest employer and accounts for 80% of exports totalling $28 billion and massive profits. Exports continue to grow, by 9% this year. The BGMEA’s statement on rent indicates the power of garment bosses as a faction of the ruling class; to preserve their profits they are pressuring the local landlords to subsidise the living costs of garment workers; landlords must cut their profits to protect those of the garment bosses. This is in addition to the various hefty subsidies and tax concessions the industry has received from the state over the years, all of which has delivered enormous wealth and luxurious lifestyles to the garment bosses. Workers in the country's readymade garment (RMG) industry work under abusive situation, which has further worsened in 2016 compared to that of three years back, according to a recent NGO report. Factory managers and line supervisors were reported to verbally intimidate and pressurise workers to complete orders by using foul language and scolding, including sexual insinuation, it said. According to the report, the factory authorities denied to allow the workers maternity and sick leaves, and delayed their payment or did not give due wages at all. Employment hardship is often accompanied by poor living conditions, and high rental costs consume a significant amount of the workers' monthly wage, the study also showed. This is an enormous financial burden for the workers, as each of them paid more than Tk 2,500 per month for their accommodation from an average salary (without overtime) of Tk 6,183, an amount below the national poverty line. The report said low wage of workers has been the major driver of the country's RMG sector competitiveness after the phasing out of Multi Fibre Agreement. The interested Western powers with the ability to pressure and influence local garment bosses – governments, unions, buyers, retails chains etc - have concentrated on infrastructural improvements to buildings and equipment in the hope of avoiding another embarrassing disaster. A new minimum wage procedure is in place, as is a factory inspection programme. But this is all focussed on appearance, what promotes the best image for their global retail brands and avoids reputational damage. Without adequate enforcement this is all cosmetic to hide the exploitative reality behind it; the major buyers from these brands are disinterested in reducing their profits by insisting on a realistic living wage for workers or paying a little more to help make it possible. Nor have they pushed as hard for actual enforcement of the laws on worker safety and treatment within the workplace. One of the post-Rana reforms was the right of garment workers to have trade union representation in the workplace. There have been various allegations of obstacles in registering new unions with the state, dismissals and harassment of union members and activists and attempted monopoly of unionisation by American NGOs. Though there are now an estimated 15-20 unions active in the Ashulia area their influence seems limited; the recent strikes were wildcats and both employers and unions complained that they had been bypassed by workers failing to present demands before walking off the job, as is required by law. Bangladeshi garment workers have decades of experience of wildcat strikes and the stubborn reluctance of bosses to accept unions is likely to continue this wildcat culture. The reformist and legalistic outlook of the aspiring union bureaucrats is anyway generally out of step with these self-organised wildcat traditions and their attempts to institutionalise and tame it have so far not been very successful. This is not to dismiss the likelihood that within the wildcat strikes there is now more influence of rank’n’file union militants, perhaps a little similar to the ‘unofficial’ role shop stewards in European unions have had in wildcats. But under Bangladeshi conditions all strikes are so far wildcats – there is no similar established union presence in the workplace and organising must often be both more spontaneous and more clandestine. With full rights for trade unionism recently granted as part of the reforms over fifty unions are now promoting themselves as self-appointed representatives of garment workers’ interests. Yet most of them are mere auxiliaries of small leftist parties with tiny memberships and little or no experience of functioning as workplace negotiators. Most union leaders are not and have never been garment workers themselves but are Party cadre and/or allied to NGOs as academics, lawyers etc. They see for themselves a role typical of middle class professionals; mediating in the interests of social peace and cohesion between the claims of workers, capitalists and state. They share the obsession with economic development and productivity of all those classes above the workers who seek to utilise workers’ labour power to build the nation state and economy. They seek only to moderate the inevitable class conflict involved in class exploitation and ‘humanise’, insofar as possible, the alienated labour of the wage slave. They seek to develop more modern and productive forms of alienation. The establishment of the legitimacy of their own mediating and representative roles are part of this modernisation. Such a reformist and legalistic approach is part of the ideology and function of trade unions as brokers of labour power to bosses, mediators of conflict between classes. (Its moderation is also probably meant to imply that these union leaders are not worthy of arrest.) There is perhaps a shift now among some garment bosses who begin to see the potential usefulness of unions as a mechanism to bring more control over labour disputes and make negotiations easier – but at the same time they appear unconvinced that the unions yet have sufficient influence among workers to deliver this. Dec 23rd; Nazmul Huda, a TV and newspaper journalist regularly covering Ashulia labour unrest, is arrested. Police accuse him of submitting false news reports and “instigating workers to create anarchy”. "He is an accused of inciting unrest among the garment workers, holding secret meetings with seven labour leaders whom we've arrested, and trying to destabilise the government," said Dhaka district Police Superintendent SM Shafiur Rahman. He is charged under the Special Powers Act – a general emergency legislation with wide repressive powers - and Section 57 of the Information and Communication Technology Act which appears to be a catch-all cyber crime law convenient for state suppression of unwanted views. The past two years have seen a general repression by government against those expressing any opposition or reporting of opposition. Newspapers have been closed down and journalists harassed while social media is being more tightly controlled by the state with registrations and censorship. In this nominal parliamentary democracy the norms of bourgeois democracy are fragile ‘rights’ - often withdrawn, suspended or with no substance to them. Several atheist and secularist bloggers have also been murdered by Islamic militants, as have numerous other critics of fundamentalism. After mounting criticism some arrests have been made of alleged Islamic attackers, but bloggers have also been prosecuted for ‘defaming religious groups’ and had sites shut down. The strikes have ended and those workers and union militants not in jail, hiding, on the run or sacked are back at work; but the resentments remain, as do the material conditions giving rise to them. The present movement shows the limits and cosmetic nature of many of the reforms brought in since 2013; without adequate enforcement, many of the legal ‘rights’ of workers used as camouflage by Western clothing brands to absolve themselves of guilt and to distance their Corporate Image from ‘sweatshop exploitation’ remain a dead letter. It is a sign of garment workers’ continued collective strength and determination that, even under the present repressive conditions, they can still organise their own resistance on a mass scale. E.g., a stricter approach to registering of all employees in the workplace, use of ID etc – these may have some legal benefits for workers, but probably also make it easier for bosses to blacklist militant workers. This indicates how weak and/or half-hearted the pressure from Western reformers and retailers often is on the Eastern clothing industry. As a parliamentary democracy (even if highly corrupt and with democracy periodically suspended) and predominantly Muslim society Bangladesh is seen as a positive role model by Western powers. Its strategic importance as a buffer against Islamic fundamentalism is also an important reason for giving support. thanks red. your essays on this area over the years have been very informative. Fred it would be great if you or someone else could post this to our Dutch language section. Just echo others' thanks for writing and posting this excellent article. My partner works for a UK firm which has factories in the "developing world". So I get to hear of things with the audit process (by big Western retailers). It is commonplace for factory bosses to bribe factory inspectors, or bribe workers to lie to inspectors when they come about conditions, or both, for them to pass ethical audits.